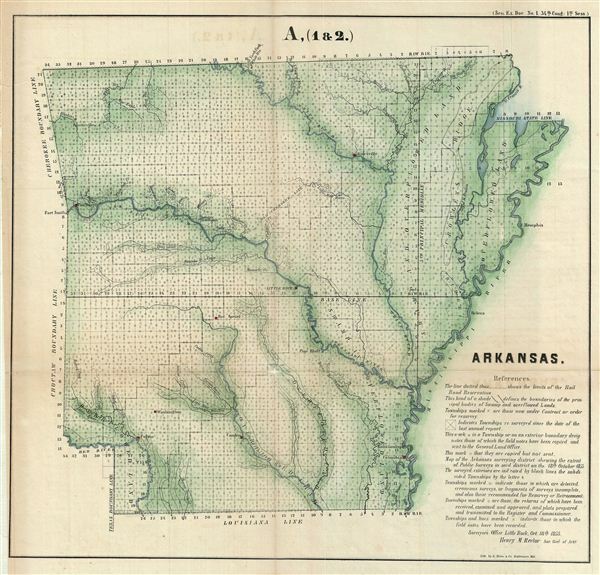 This is an attractive example of the 1855 public survey map of Arkansas prepared by Henry M. Rector, Surveyor General of Arkansas. The map covers the entire state of Arkansas. The state of the Land Survey is also noted via a series of blocks representing the survey grid. A table in the lower right quadrant explains the various markings on the blocks. Identifies Little Rock, Camden, Hot Springs, Fulton, Fort Smith, and Batesville among other important landmarks. Various towns, rivers and various other topographical details are also noted. This map was engraved by A. Hoen and Company, government printers, in Baltimore, Maryland for issue in the 1856 congressional report, Maps and Views to Accompany Message and Documents 1855-56.